Graphical type conversational software for easy automatic grinding data editing. ・A total of 21 Grinding wheel and work data can be stored. ・Easy to touch and input necessary data.Touch screen minimizes the number of switches. ・Standardize table enclosure, AC spindle motor , AC servo motor for work spindle. Achieve high level of grinding accuracy by table enclosure for a stable grinding condition and working environment. Shorten grinding data entry process by automatic editing function. Contouring form as well as universal form and carbide contouring grinding on our unique software. ・Own developed program software is able to work for contouring form as well as universal form, and carbide contouring grinding. ・Easy to touch and input necessary data.Touch screen minimizes the number of switches..
・Taper and contouring grinding software by 2-axis simultaneous control is an option on IGM15NCIII model. Available data storage, of high level of grinding and grinding conditions. ・IGM15NCIII-2 having 2 spindle unit, available to grind step bore, face, O.D. in one chucking.Improve concentricity and perpendicularity. Adopt scale feedback for wheel infeed contribute sizing accuracy. Processing software including know-how from years of experience, important for processing profile grinding in addition to the performance of the machine. EDELAC Win can import data and post process software developed by Okamoto, to create the best program quickly and simulate grinding wheel track on PC screen. It gives a great advantage to check interference of wheel and work for internal form which is hard to confirm by viewing. Improved accuracy, operability, performance and productivity. ・Max. 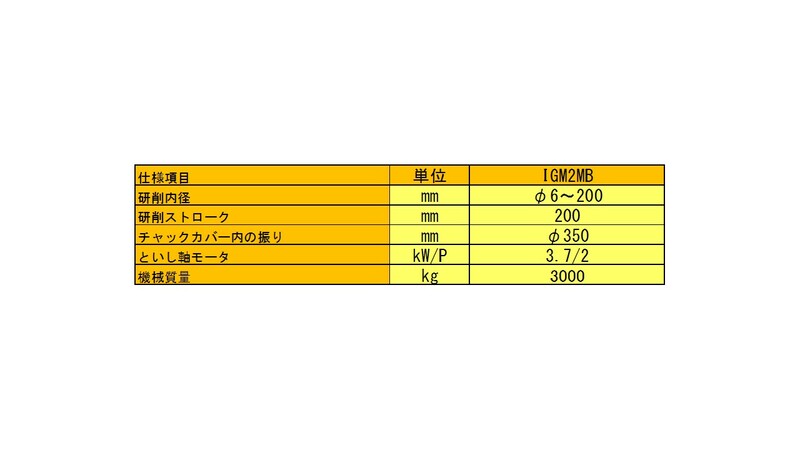 36 grinding conditions can be stored including items set by switch and table speed. ・Adopted ball screw with servo motor drive and linear guide way for table longitudinal effect for accurate positioning in blind hole end.No hydraulic unit in this machine. ・Table postions can be set by teaching system using symbols at the bottom of the screen. ・Maxuim 8 continous process possible using Conversational Software. Table reverse position and start infeed position can be set by teaching method or key input method. ・Change workpiece length by shifting workspindle base left or right. Also possible to have intrupt dress, Cycle stop and Infeed return during cycle. ・Face Grinding of Long workpiece available by option. 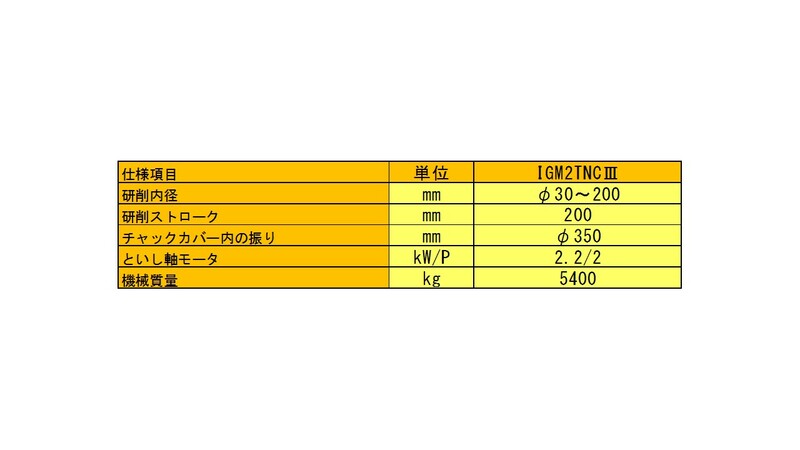 ※ The specifications of IGM2TNC-3 and IGM2TNC-4 will be discussed separately. Best Machine for medium Lot mass production like automotive parts. 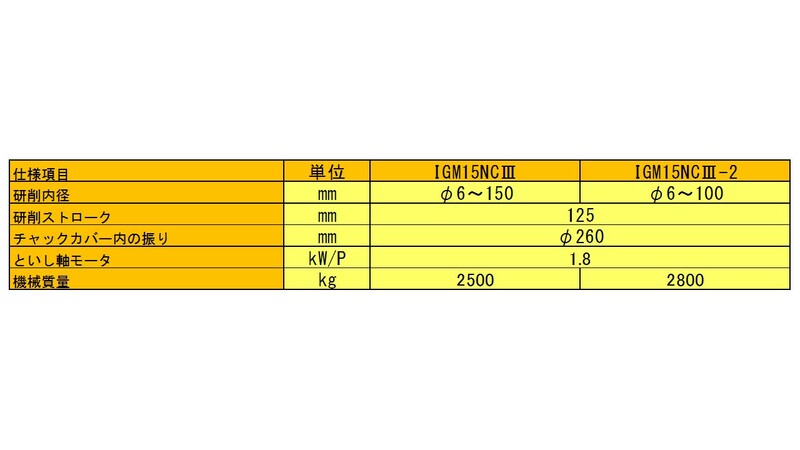 Machine width is only 840mm machine. ・Achieved 840mm width machine after re-check all elements and components. ・Cycle time improve drastically by vertical infeed speed 15m/min high speed approach and 490 reciprocate/min. (in 2mm stroke). ・small size articulated robot and measuring device beside of machine available as option. 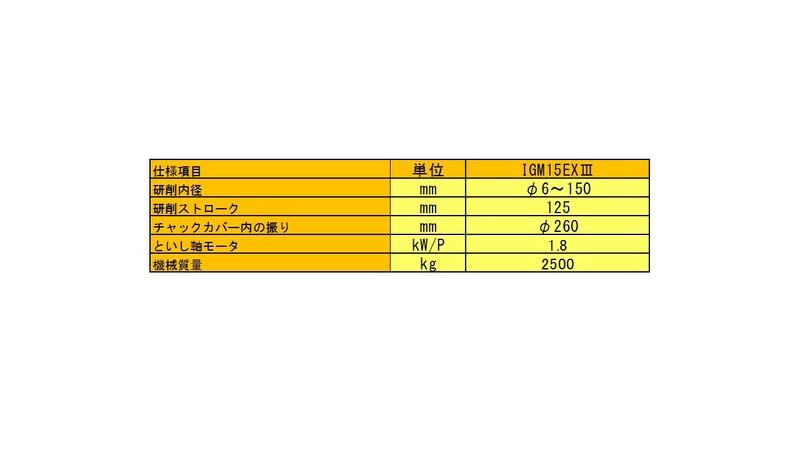 Work for following cycle : Unloading & Loading ⇒ Washing workpiece ⇒ Measurement ⇒ Compensation.